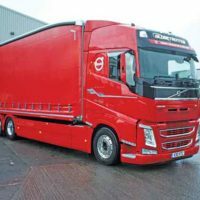 Navigating the urban labyrinth with a short wheelbase trailer is popular on the European continent, but isn’t quite as common in British cities, so Kevin Swallow trialled a Volvo FM tractor unit to see if articulation can make life easier. THERE IS no ‘one size fits all’ when it comes to urban deliveries. 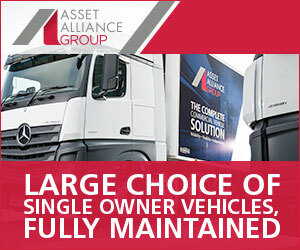 Choosing the right vehicle depends on what you are delivering and how often you’re delivering it. Should you decide a van is too small and you need a truck to do the work then it’s worth considering how a tractor unit and trailer might stack up against a rigid vehicle. In this particular case, Transport News is putting a 4×2 tractor unit to the test coupled to an urban trailer on our Distribution Route (see boxout). According to truck registration figures published by the Society of Motor Manufacturers and Traders, operators buy one 4×2 tractor unit for every nine 6x2s. The reasons why operators go for three axles are multiple; GVW, price, residuals, versatility. 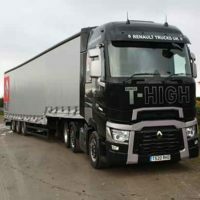 While two axle tractor units dip in and out of fashion like 1980s boy bands, it has remained a popular choice for supermarkets and retailers who like to use the short wheelbase trailer. It provides a greater combined vehicle weight (GCW) than any rigid, up to 38,000kg, with the right specification, although there is also the question of capital outlay; a truck and trailer is going to be more expensive than a rigid. This particular Volvo FM420 4×2 tractor is coupled to a Krone City Liner Dry tandem axle semi-trailer. The FM is fitted with the Globetrotter LXL cab and a direct vision window in the passenger door. It is the low mounted cab with a high roof that rides on a steel front suspension. Underneath the cab is the D13K 420 diesel engine, which is a 12.8 litre, 6 cylinder in-line diesel engine using common rail high pressure fuel injection and rear mounted timing. The Euro 6 rating is met with a combination of mild exhaust gas recirculation (EGR) at 10% that requires no EGR cooler with the rest of the work done by selective catalytic reduction (SCR). The D13K is available in four ratings; the entry level one which we tested is the 420, then there are the 460, 500 and 540hp. True horsepower on our test unit is 414hp between 1,400 and 1,800rpm with 2,100Nm maximum torque from 860 to 1,400rpm. Transmission is the AT2612F I-Shift direct drive 12 speed automated, specified with the Eco Performance package. Secondary braking is delivered through the VEB+ engine compression brake that can produce 375kW at 2,300rpm. The rear axle ratio is 2.50:1. The wheelbase is 3,700mm, it has Alcoa wheels with 355/50R22.5 Michelin X Line Energy on the front axle and 295/60R22.5 Michelin X Line Energy on the drive axle. It’s plated for 7,100kg on the front axle and 11,500kg on the drive axle, with the trailer running on an 18,000kg bogie, making the gross combined weight 36,000kg. The tractor unit weighs in at 7,980kg, the trailer is 5,820kg, so the payload is 22,200kg. • A panel van plated at 3,500kg GVW has a 1,000kg payload. 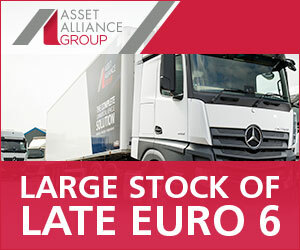 • A two axle rigid plated at 7,500kg GVW has a payload from 3,000 to 4,000kg. • A two axle rigid plated at 18,000kg GVW has an 11,000kg payload. • A three axle rigid plated at 26 tonne GVW would expect to get 15,000kg payload. • A four axle rigid plated at 32 tonnes GVW would look for 20,000kg payload. To date Transport News has put two 6×2 rigids through the distribution test route, and each fitted with a rear steer axle. Renault Trucks T380 (TN, November 2017) and the DAF Trucks CF370 (TN, February 2019), and each proved adept at tackling the urban jungle. Volvo has made this particular FM simple to drive. On the dash are the buttons for the transmission; drive, neutral and reverse, as well as a gear hold function and a gear change switch to go up or down the box. 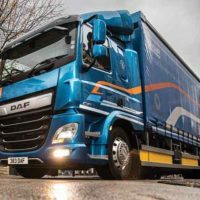 Its fitment is driven by demand from the supermarket and retail sector whose drivers jump from one truck to the next, as well as dealing with an unintended consequence of original internal cab design. Once onto the A74 into Glasgow from J3A off the M74 the nearside proximity sensor kicked off delivering an ear-splitting warning that something was nearby. As audible warnings go, it’s difficult to ignore although it can be adjusted so that it doesn’t dislodge the driver’s fillings. With a rigid, even with a rear steer rear axle, the pivot point remains the drive axle, so the wheelbase is the critical element. The driver still has to get the cab out into traffic or into a second lane to get enough room to sweep around. With a tractor unit the wheelbase is significantly shorter, and with a ‘forced steering’ rear axle on the tandem trailer the articulation angle is reduced. Turning early doesn’t lead to cutting off the corner with the side of the trailer, instead it follows the tractor unit. It is less intrusive to other traffic and uses less road space. Through this section the wagon stuck to its lane and only rarely did it venture across the white lines. The process was helped by use of the Volvo Dynamic Steering (VDS), now becoming a popular choice. Turning the steering wheel using a single finger at walking pace makes for precision steering, and in the city that is often vital. Comfort and storage are the two main features of the LXL cab. Two lockers above the windscreen have roller doors, and underneath the bed are a pull-out cooler and two large storage compartments that are accessible from the outside. It is a single bunk option so the backwall is fitted with three storage compartments, equating to 154 litres of additional storage instead of a second bunk. In the dashboard there are four open storages, a small storage box, a DIN slot storage and an optional bottle holder. The cab is equipped with a roof hatch that can be opened 50mm; it can be manually or electrically operated. The electric option is only available on the LXL cab. Compared to the two 6×2 rigids that have navigated the distribution test route, each fitted with a rear steer axle, the articulated version is by far the more manoeuvrable and used less road space. While it might cost more to buy, it can carry more freight and is more versatile, and a trailer swap is quicker than reloading the same vehicle. In our next edition the Volvo FH420 6×2 rear steer will be tested on the same route, and it’ll have to do well to match the versatility and productivity of a four axle articulated distribution truck and trailer. IN THE main choosing an FM over an FH as a tractor unit is rare mainly because of the better residuals with the bigger specification. Bucking that trend is CEVA Logistics, who put 85 new Volvo FM11 litre tractor units into service. The 6×2 fixed pusher axle tractor units are on low chassis heights and low profile tyres and powered by Volvo’s D11K Euro 6 engine rated at 450hp. The Globetrotter cabs feature Volvo’s all steel safety cage design and an overall height of 4.0m, ground to top of air deflector. Ordering the Extra Low chassis height was done to improve both driver cab access and visibility levels. The latter enhanced views are further complemented by additional factory fitted lower glazing panels in the passenger doors. Vulnerable road users have also been taken into consideration with audible left turn alarms, mobile CCTV camera systems and anti-spill fuel tanks.